Trusted since 1963. Take it now online Today Discover your strengths. Improve your relationships. Do opposites attract? Sometimes they do, and sometimes they don’t. Someone who loves to take the lead might get along very well with someone who likes to “go with the flow.” However, someone who prefers order and routine, might not get along with someone who prefers change and variety. 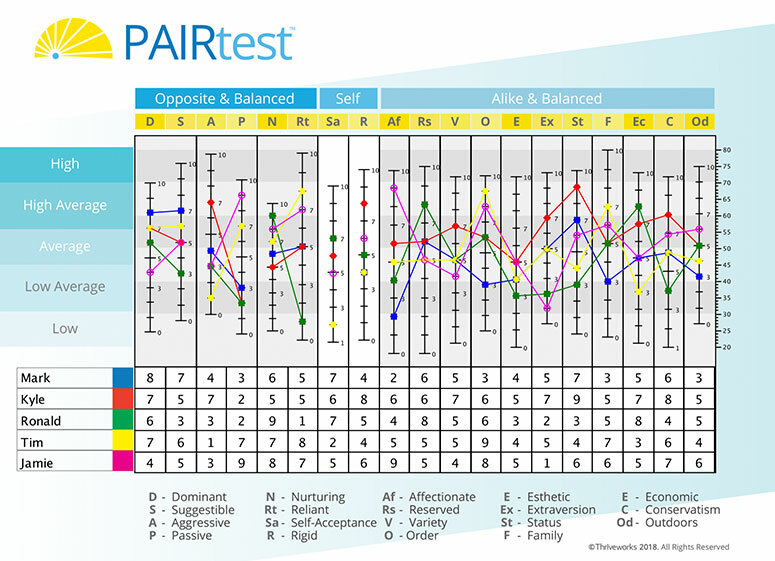 The PAIR test has been a trusted personality inventory since 1963. It help users to learn more about themselves, in particular how their personal styles effect their relationships with those closest to them—whether their relationships be familial, romantic, or work related (or all three). We're not the only ones talking writing talking about Thriveworks. Learn more about you and your strengths through the PAIR’s 19 different personality measures. In particular, learn how your styles compare with others, and how the way you perceive, and interact with, the world effects important relationships in your life. Build a compatible and effective team or group, and avoid personality conflicts before they start. Learn why you and a loved one interact the ways you do. Find out how to capitalize on your strengths, and negotiate natural conflict areas. The PAIR test measures 19 Personality Traits. Unlike other tests, when you complete the PAIR your results can be displayed in connection with another’s results. To the right are PAIR results for two fictitious individuals “Adriene and Charles.” Revealed are areas where their relationship is likely harmonious, and some areas where they might experience conflict. By viewing personality styles in this way, Adriene and Charles can develop a greater understanding of one another and their relationship, and can learn how to prevent conflict before it starts. Have questions? Read our FAQ page, or contact us. Download the Personal PAIRS Manual.